I can’t really remember how Kor Kor started his love affair with trains, especially since I used to dislike Thomas and his friends. (Now I have grown to love them. I judged them before I knew them. My bad.) 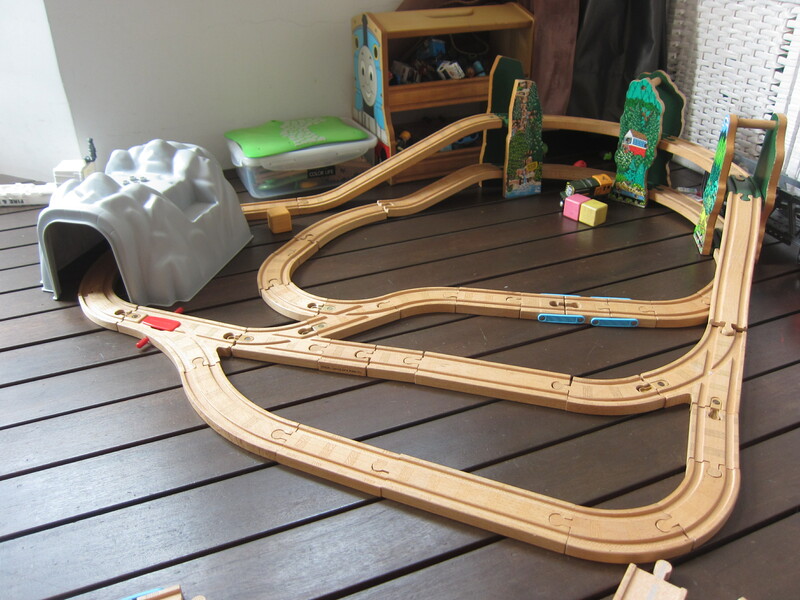 Kor Kor has been playing with trains since very young, and one of the best decisions I made was to get him wooden tracks. My choice back then was influenced by what I had read online and in books. The feel of wood. The texture. The solidness. I believe young children can appreciate the beauty of good-quality toys. Wood is a natural material and it’s like the children are feeling something real. Kor Kor built with train tracks way before he was really playing with blocks. He builds railways, simple in the beginning, much more complex now. I see how the tracks function like blocks. Both are for building, aren’t they? 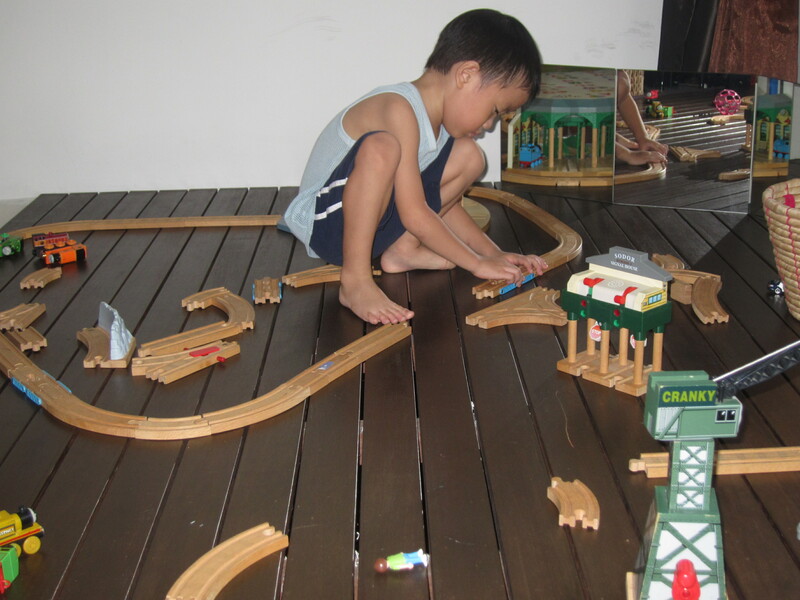 Building with tracks is no less open-ended – he can let his trains go in any direction, according to his current play. 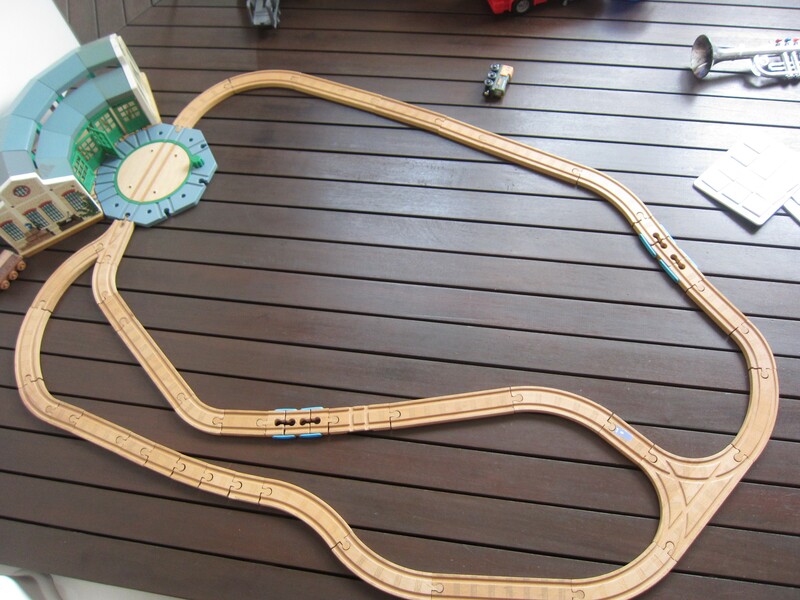 And yet it is not that easy to connect the tracks in a complete layout. 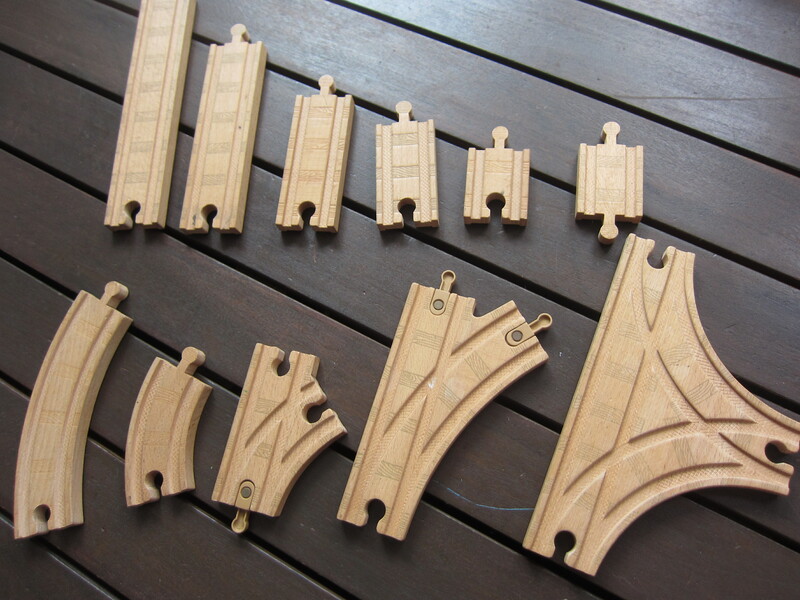 The railway can’t just go on and on; there are loops and sidings and stations and bridges to consider. He has to take into account the shape and size of the available pieces – some are long, some are short, some are straight, some are curved. He builds and rebuilds a few times a day..
Come to think of it, recently he has been spending more time building than actually playing with the trains! Came across the idea of using mirrors as part of children’s play a few years ago and I have let the kids try painting on mirrors a few times, and even drawing on their own reflections in the mirror. 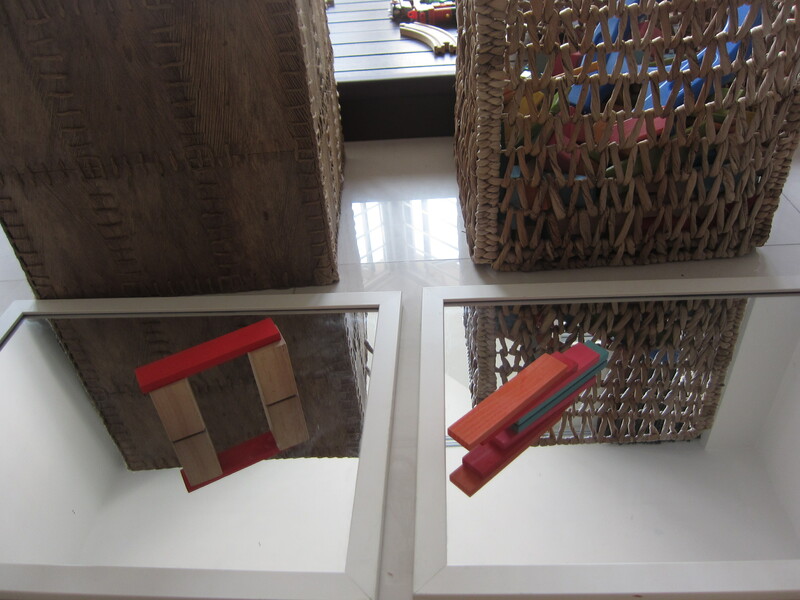 When I did our art corner, I included mirrors as a permanent fixture. 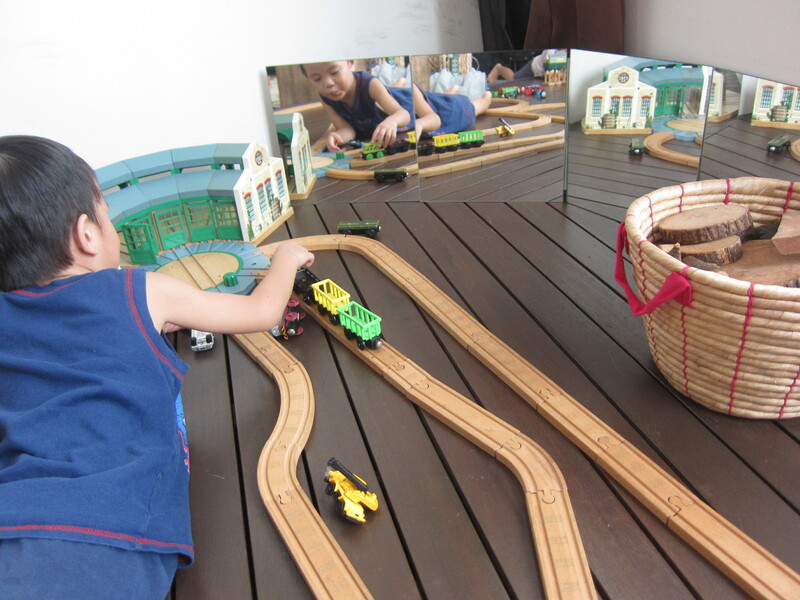 I have observed mirrors adding a new dimension to the boys’ play, whether with blocks or trains or art mediums. Check out An Everyday Story for more ideas! To be honest, I am not very sure about the origin or theories behind the use of mirrors in children’s play. I think it is a very large part of Reggio-inspired environments, which I am currently reading up on. The thing is, theory or not, the idea of mirrors makes sense to me, especially after firsthand observations of my own children. Thus, I have recently added more mirrors to our play areas. Mirrors are good for outdoor art explorations too!